Stay tuned in to the FAT Cat Haven News. Looks like nap time right now to me! 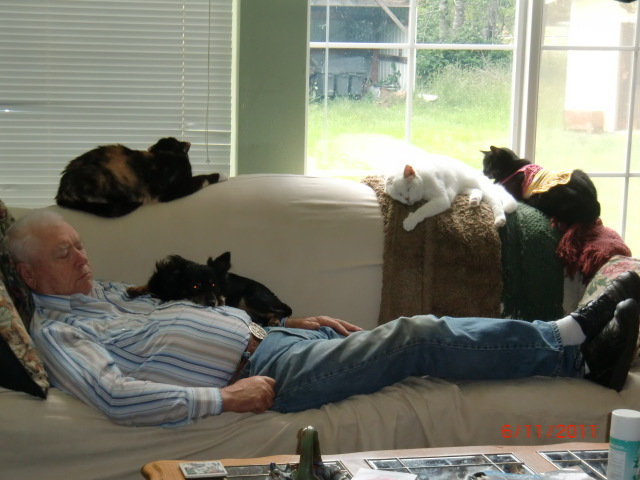 Hey, is that a doggy on Hal's chest - Yep, it's Corky. 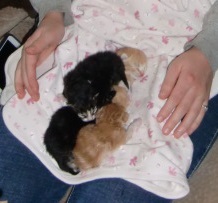 Four kittens were found with a feral cat at 2 days old. They were taken away from her so that they would not end up being feral too. Mom was caught and taken in for spaying. Kittens were all nice and fat and brought to F.A.T. Cat Haven to be cared for. That means bottle-feeding every 2 hours. They are so small at that age and need so much care. They were all spoken for before they opened their eyes at 11 days old. One of the kittens, now named "Spunky", was born with a urethra defect. He was returned to us for ongoing vet care and will remain with us. He will have continued vet care, as he needs it to remain healthy for the rest of his life. You can follow up on his progress and photos under "News" or "Sanctuary>Residents>Stories".